This DIY hair spray is natural and easy to make. You can stop covering your hair with chemicals and make this fruit-based homemade hair spray recipe instead! Here’s how and why I make my own DIY hair spray. Nowadays I have very thick, curly, long(ish) hair and need to use a generous amount of hair spray no matter how I style it. (My hair scares Matt if I don’t tame it with at least a little bit of hair spray.) I used to be a fan of maximum hold hair spray, but it left my hair so crunchy my 4-year-old nephew wanted to touch it every chance he got. The cost of natural hair spray tends to make me cringe too. It’s time for something different. It’s time for homemade hair spray. To my delight, Matt received a basic recipe for DIY hair spray from a DIYNatural reader named Charli. I. Was. Giddy! I tested the recipe, made a few tweaks, and came up with this wonderful recipe for DIY hair spray. Start your DIY hair spray by cutting a whole orange or lemon into wedges and combine with 2 cups water in a small pot. Boil over medium-high heat until liquid is reduced by half. Strain liquid through cheesecloth into a measuring cup. If you boiled too much liquid out add water until you have 1 cup. Allow citrus juice to cool. Use a funnel to pour your DIY hair spray into a spray bottle with a fine mister and shake to combine ingredients. Shake before each use. This is not a maximum hold hair spray that will freeze a prom up-do or 80’s bangs. I can say with confidence that it’s a flexible hold formula. I was a loyal user of firm hold hairspray for years before trying this formula, now I PREFER this to my old sprays. This DIY hair spray formula has been tested on my brunette hair. Use oranges for darker hair, and lemons only if your hair is light-colored. There is a chance the lemon can lighten your hair when exposed to sunlight. 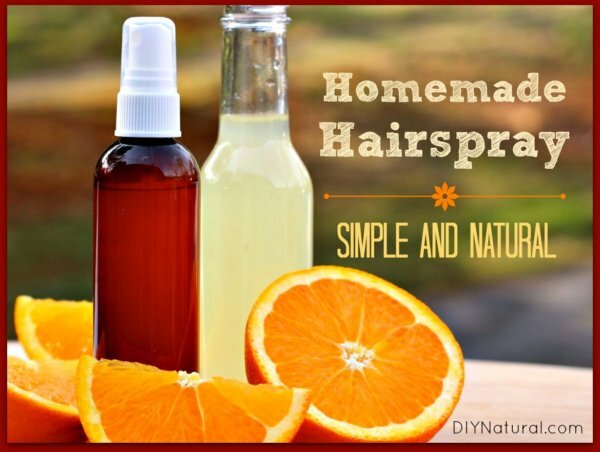 Grab the orange or lemon sitting in your fruit bowl and give this homemade hair spray a whirl! A Simple and Natural Homemade Natural Hairspray was written by Betsy Jabs.